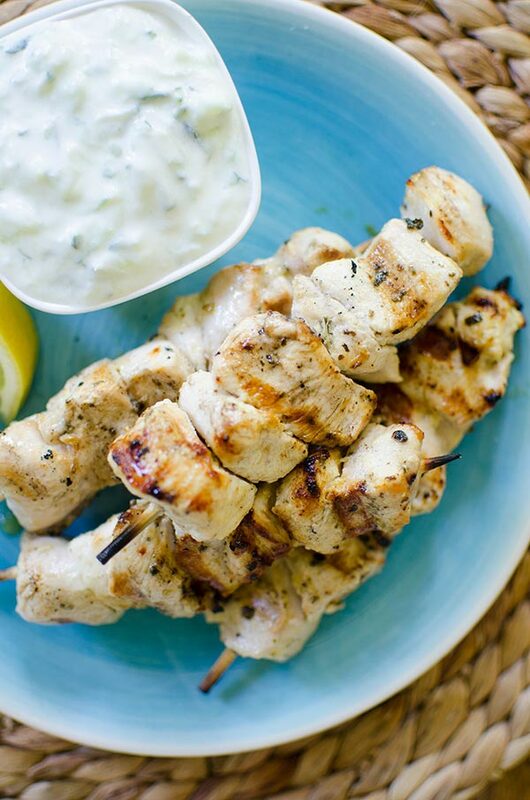 An authentic recipe for juicy Greek chicken souvlaki with olive oil, garlic, oregano and lemon juice. If you’ve been reading for a while, you’ll know that I grew up spending my summers in Greece. And while there are so many wonderful things I can say about the beaches, and the pastel-hued houses that colour the landscape, and the crystal clear blue sea, what I really want to talk about today is the food. The first recipes I ever developed for the magazine I used to work at was an entire appetizer platter of Greek recipes, it’s a style of cooking that I would definitely say is right within my comfort zone. What I love about Greek cuisine is that for the most part, it’s incredibly simple, but so flavourful. It basically encompasses my entire philosophy around food; simple, fresh and flavourful. Over there, local produce is plentiful and everything is just bursting with flavour. When we would be in Greece in the summers, my mom would do most of the cooking, but those times when we would go out for dinner or order in takeout from a local, family-run takeout restaurant in our village (the food was delivered via motorbike and you could always hear them coming from a mile away). It was this tiny restaurant called Obelix and they make the best chicken souvlaki and gyros. 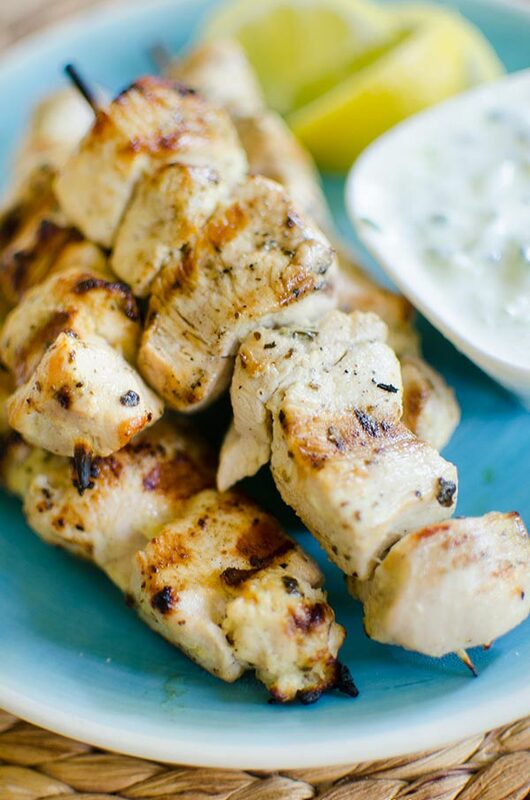 This Greek-style chicken souvlaki is inspired by this tiny, hole-in-the-wall restaurant and while it took me a while to perfect this recipe, I’ve finally figured out how to make an authentic Greek souvlaki. I always make this with a classic tzatziki sauce and a hortiatiki (which is how you say Greek salad in Greek). And while I won’t be going to Greece this summer, I’m still able to enjoy the flavours of the cuisine at home and am hoping to really nail down a few more of my favourite recipes this summer. This recipe starts with a simple marinade for the chicken, a combination of olive oil, lemon juice, salt, oregano and garlic powder. I opt to use garlic powder instead of fresh garlic here because when grilling, garlic tends to burn which would give this dish a bitter taste. You could also switch out the dried oregano for dried thyme, as those herbs are pretty interchangeable in many Greek recipes. If you love these flavours as much as I do, you should also try my Greek grilled chicken wings–you won’t be disappointed! In a glass bowl, whisk olive oil with lemon juice, oregano, salt and garlic powder. Add chicken, cover and refrigerate at least 30 minutes and up to 4 hours. Preheat grill to medium-high heat and soak wooden skewers for 20 minutes. Thread chicken onto skewers.Grill, covered, for 4-5 minutes per side. Serve with lemon wedges and tzatziki sauce. 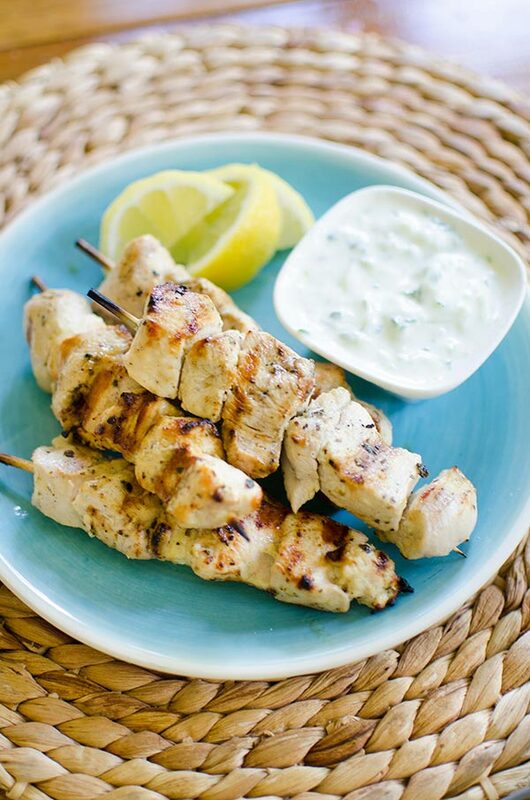 Let me know if you give this chicken souvlaki recipe a try in the comments below. Hi Akhil, what went wrong with the recipe? Love that, I hope you enjoyed it! I just made this tonight. On a pita with tzatziki and feta. Light and tasty! I'm so glad that you enjoyed it John, it's one of my favourites!